The Glacier Bay 4-inch 2-Handle Low-Arc Bathroom Faucet in Brushed Nickel has an elegant, curved design that will complement a wide variety of bathroom or powder room decor. WaterSense certified, this faucet has a 1.2 GPM rate to help reduce water use and washerless cartridges to prevent drips. Easy to use with easy control metal lever handles, the sleek low-arc spout allows plenty of sink space. This faucet features the Glacier Bay Exclusive ClickInstall drain assembly for quick and easy installation. Purist faucets combine simple, architectural forms with sensual design lines and careful detailing. Both sculptural and functional, this bath- or deck-mount lavatory trim promises inviting visual appeal of classic modernity, and features a 7-1/2" spout and two cross handles. Also available in store by special order only see store for details. 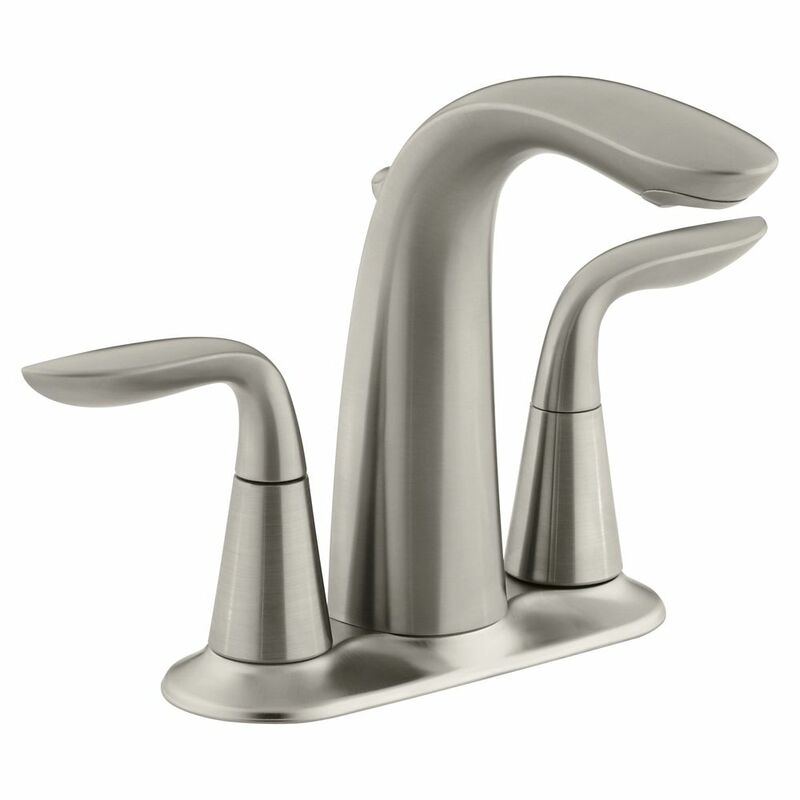 Refinia(R) centerset bathroom sink faucet with lever handles is rated 3.8 out of 5 by 4. Rated 1 out of 5 by HappyBuyer from Water splashes badly. Water splashes badly. Rated 5 out of 5 by Kevin from We purchased 2 Brushed Nickel Faucets. My wife absolutely loves... We purchased 2 Brushed Nickel Faucets. My wife absolutely loves them. Rated 4 out of 5 by Ace from The faucet had an additional piece of pipe on the... The faucet had an additional piece of pipe on the drain pipe. It must be tightened very strongly or the pipe will leak around nd this piece.Otherwise, the faucet is very nice. Rated 5 out of 5 by George from Very well constructed and easy to assemble. One drawback is that it has permanently installed hos... Very well constructed and easy to assemble. One drawback is that it has permanently installed hoses at the faucet end, which means if your connections are closer or farther away than the length of the hoses, you may have some difficulty making them connect without twisting them or somehow extending them.